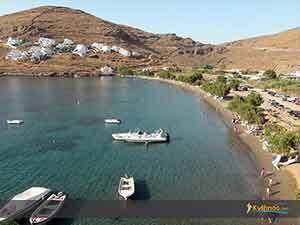 It’s really strange when thinking how it is possible for a Cycladic island, which is so close to the overcrowded greek capital Athens, to remain one of the few unexplored paradises. 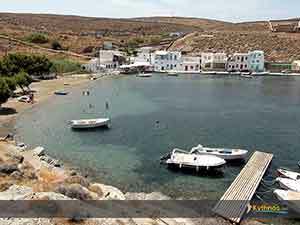 If Kythnos could reach out its hands it would reach Kea with one hand and Serifos with the other. Looking at it on a map it’s like a bird with stretched wings to the North and to the South as if it’s ready to fly, to get away from the deep blue Aegean waters and fly away to unknown places with all its treasures: the beaches, the beautiful landscapes , the golden sunsets, the scented gardens, the churches, the traditional houses with the red roofs, the picturesque streets, the lonely windmills, the ancient history, the archaeological sites, the thermal springs , the joyful and hospitable people. 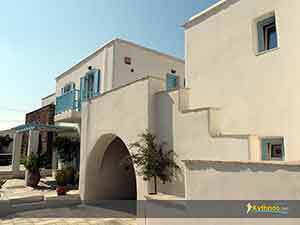 Thermia is the name the inhabitants have given to their island, even from the 12th century A.D., due to its thermal springs, which are still in operation, offering relief to a lot of patients. 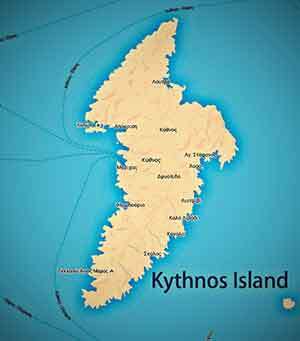 Kythnos is only 56 nautical miles away from Piraeus port, a distance which is covered within 2 hrs and 40 min. by the modern ships that reach the island. From the port of Lavrio the distance is only 2 hrs. 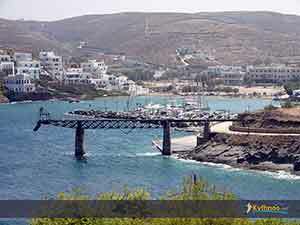 The island of Kythnos and the surrounding islets constitute the municipality of Kythnos, which consists of two communities: Dryopidos community and Messarias community. 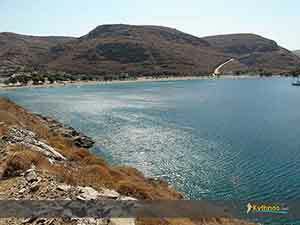 The island belongs to the Cyclades prefecture of South Aegean. Its length is about 100,2 sq.km. and it’s got a coastline of 104 km. The population is 1456 people. Kythnos is not mountainous, but it’s got stony ground. The highest top is Profitis Elias ( St.Elias) on mount Petra (Stone), at 336 m. hight. 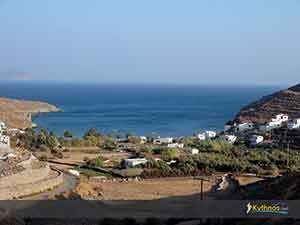 There is minimum vegetation, a characteristic of all Cycladic islands, and it’s limited in only few olive trees, fig trees, almond trees and a few pear trees. There are quite lots of (ξερολιθιες) and bushes. The pine trees forest of Panagia Kanala is the only exception in this scenery. Nevertheless, the inhabitants cultivate this dry land with care and love, producing exquisite products like the well-known thyme honey. Fishermen provide the island with fresh fish every day. The number of fishing boats is disproportionately big in relation to the population. On all the islands and mainland Greece, it is impossible not to stumble upon something that has been around since pre-antiquity. There have been finds dating from the Neolithic age all the way to the medieval age. 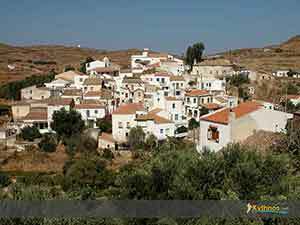 A few traditional villages along with their many traditions dot this tiny island. Thermia was the name given to the island during the middle ages. This is due to its springs, indicating volcanic activity far below the surface. At Loutra, the springs were developed into a bath house by the Romans one of which still exists at the top of the square. The structure of the bath house is quite impressive. There are several rooms, each with a large tub. The minerals have stained the surfaces over the centuries of use. The water is ferrous, saline and sulphurous the combination of which are believed to cure various ailments amongst which are arthritis, gout, gynecological problems and rheumatism, as well as many others. 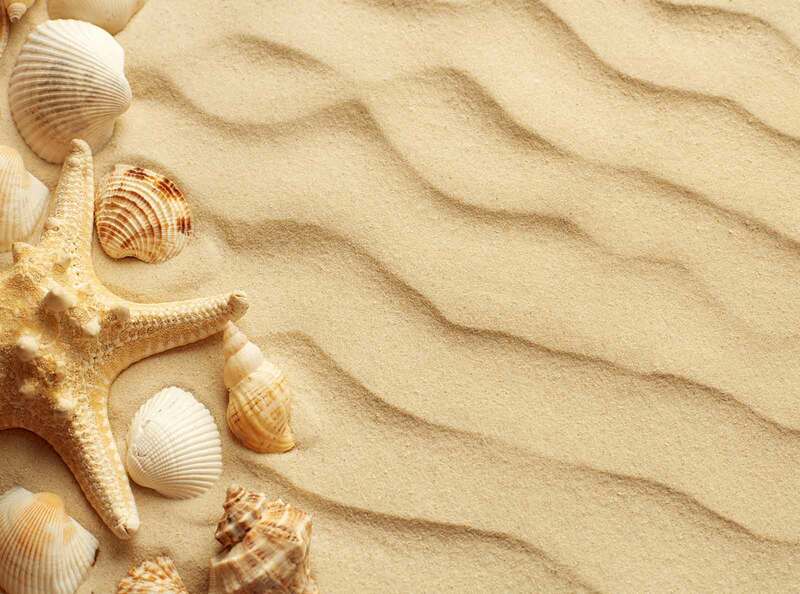 The climate is temperate Mediterranean and it is considered to be very healthy. Like in all Cycladic islands northern winds are very strong and their strength is exploited for the production of wind power. Visitors can see small and big gulfs with more than 92 mainly sandy as well as a few rocky beaches , sailing round the island. Most of the beaches can be reached by car. Northern coasts are quite steep and rocky. There are no beaches with organized facilities, so swimmers can hide from the sun under the shades of the tamarisks. 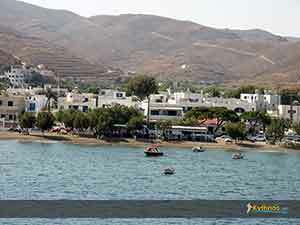 Ιf you seek for tranquility and simplicity you should visit this island. Here you won’t find big hotel resorts; just small businesses of 2 to 6 rooms. Transportation in the inner part of the island is supported by buses , connecting all the villages. Sea-taxis can carry passengers to secluded beaches with scheduled or extra rides. 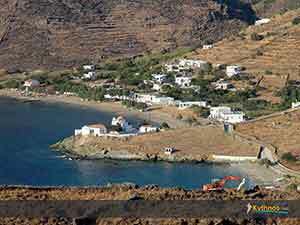 Kythnos has important archaeological sites , museums and a magnificent unexplored cave. A visit to the wind-power park or to the old mines can also be a pleasantly surprising experience.